Removable dentures can be used when a patient is missing all their teeth or partial dentures are made when there are still some strong, healthy teeth remaining. As Dr. Chiu and Dr. Singh are trained prosthodontists, they have extensive training fabricating well fitting, comfortable and esthetic looking dentures. 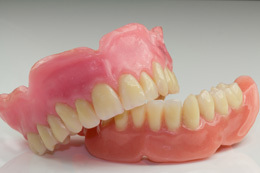 Making a proper denture can take a few appointments and definitely takes patience. We are trying to recreate your whole entire mouth after all. Is your denture loose, uncomfortable, hurting, and just doesn’t feel right? Fabricating dentures is generally a difficult procedure to execute and requires much patience from both the doctors and patients. With good communication and patience, we are able to reconstruction your whole mouth so that you can improve your quality of life. Sometimes just adjusting your existing dentures is enough; other times you may need new dentures to rid the problems. On rare occasions, we may even use our surgical colleagues to be involved in order to make a denture that works properly and well for you. With implants, now dentures and partial denture can be made more secure and retentive to allow patients better function. We have seen all our patients enhance their denture experience with implants and have yet to meet someone anywhere where things are worse with implants. It is truly a life changing phenomenon for these people. Please ask us today how this can be applied to you to better improve your situation!